Almost ready for the season to start! After a lot of headaches and tail chasing, I finally got to the bottom of this phantom menace. For those that are wondering, this is what had my season come to a sudden stop right after Nationals last year. This problem came out of the blue unfortunately and caused some stressful times trying to figure out what the cause of this was. To recap in short, it started with a sputter at around 8,000 rpm. After changing a few things (like the fuel pump), it started to behave in a way like it was hitting a wall above 6,000 rpm, with the Air/Fuel Ratios spiking to 20 (lean) at Wide Open Throttle (WOT). Keep in mind, this was at random in the beginning, but now it was happening all the time. A couple of things were done to troubleshoot this issue. For starters, the grounds were tested, followed by the MAF (because a failing MAF has the same behavior, as seen back in 2011 for me), and then tested ignition coils. 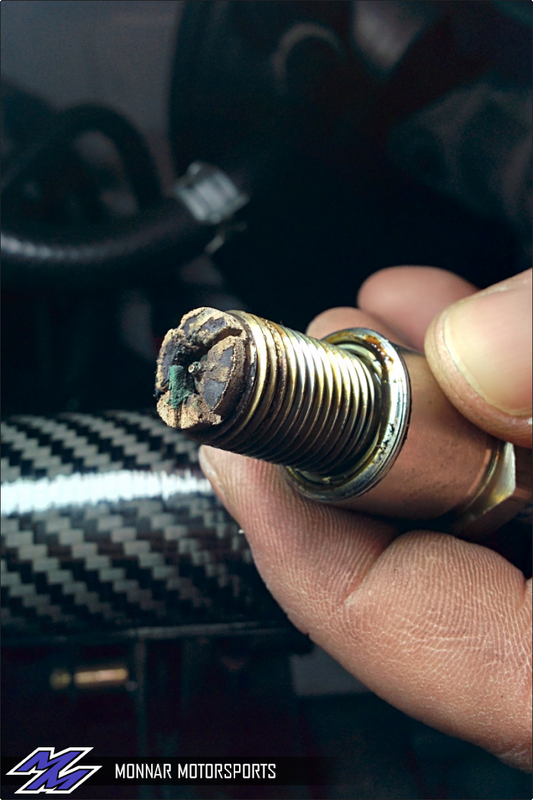 After that all checked out okay, we noticed the spark plugs were overheated with a green-like color at the tip (literally looked like moss growing on the plug), which was probably the cause of the sputtering at the last Renegade Miata event. 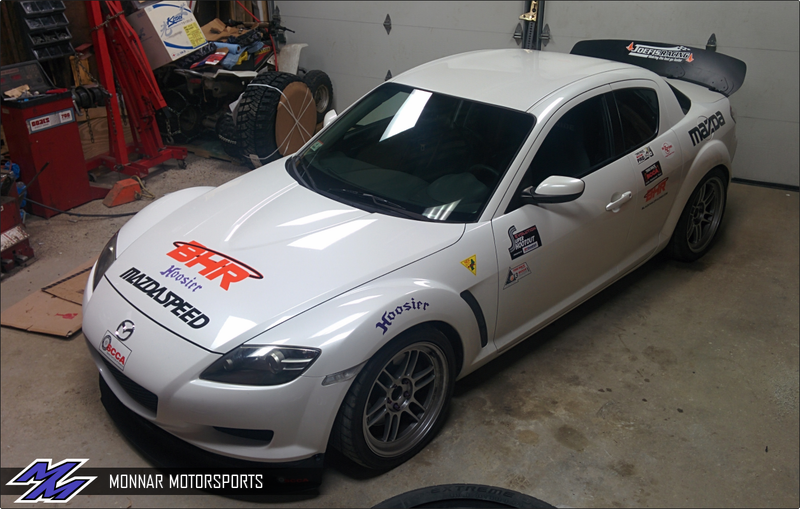 Those got replaced, but we changed the leading plugs to stock RX-7 (FD3S) NGK spark plugs because they are colder. Looks like moss, doesn't it? By this point, Shane had finished his install of the fuel pressure gauge so we could see what exactly is going on with the fuel. That is when we noticed at WOT, the fuel pressure went from 57PSI (which was a touch low in the first place), down to 32PSI, and then 18PSI! Then the voltage going to the fuel pump was tested, and it checked out at 14 volts. Submerged the fuel pump housing and put power to it, and it worked out okay, with no leaks. So the last step was simply to just replace the DeatschWerks DW200 pump with a new Walbro 255lph pump...And then like magic, everything was fine. I had heard nothing but good things about DeatschWerks fuel pumps, but clearly I managed to get a bad one. 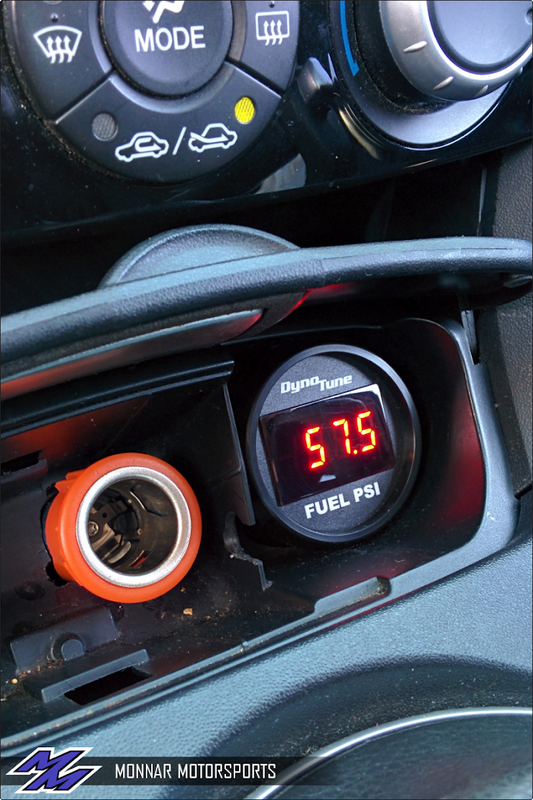 Shane did a great job with this install of the DynoTune Fuel Pressure Gauge! It is funny how sometimes the parts you replace, can sometimes be just as faulty or even worse than the part you're replacing. I'm just glad that the fuel issues are finally over, and I can finish focusing on getting ready for the season starting next week. Huge thanks for those that helped me troubleshoot this issue, and thanks to BHR for providing me with the new fuel pressure gauge setup to be able to troubleshoot this problem. Be sure to stay tuned for the upcoming races!